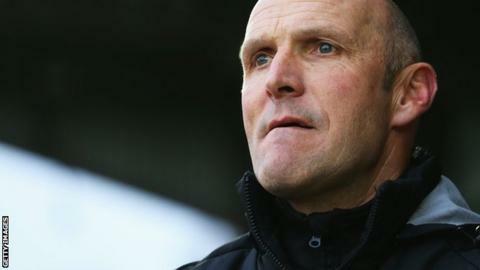 Chester boss Steve Burr is still keen to bring in new players ahead of the close of the August transfer window. The Blues, reprieved from relegation in June, have made a faltering start to the new Conference campaign. Burr has been told that funds are limited, but he told BBC Radio Merseyside: "We need to strengthen. "I've asked the question and I'm waiting to hear what can be done. Hopefully we can do that. Now it's just a question of waiting for the answer." Burr has already made 10 summer signings, highlighted by the capture of veteran duo Chris Iwelumo and Gareth Roberts. Iwelumo had his early second-half penalty attempt saved in Monday's 2-2 draw at Burr's old club Kidderminster, but the Chester boss feels his reshaped team are starting to knit together, having recovered from 2-0 down after nine minutes at Aggborough. Although concerned that Chester have conceded five goals during the opening 10 minutes in their first five matches of the season, Burr is comforted that their three defeats were against the sides who now form the top three in the fledgling table: Barnet, Forest Green and Halifax. "We took advantage of Kiddy going down to 10 men," added Burr. "But, having said that, we missed a penalty and really should have won. "We're not helping ourselves. We're giving goals away and giving ourselves a mountain to climb. "To be 2-0 after 10 minutes when we'd actually started brightly was very poor. If we're to stay in this league, we can't be doing that." But, coming off the back of Saturday's 3-0 home defeat by Halifax (which followed the 5-0 opening day Deva Stadium spanking by Barnet), Burr is now optimistic going into this weekend's trip to Gateshead. "The difference between how we played against Kiddy and Saturday's performance was huge," he added. "And I know what players are like. They thrive on confidence." Chester manager Steve Burr was talking to BBC Radio Merseyside's Neil Turner.